What could be better than a holiday centered on food? And not just any foo d, but delicious donuts? Nothing, that’s what! 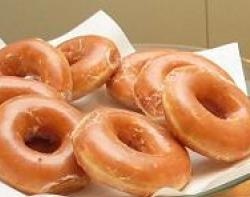 It’s National Donut Day, the first Friday of June every year, where donuts seem to rain from the sky, because everyone gives them out… for FREE! This fantastic holiday was created as a fundraiser by the Salvation Army back in 1938 to honor the women who served donuts to the soldiers during WWI. Since then, the holiday has transformed into a donut free-for-all (literally), and people flock to their favorite donut shop in hopes of scoring their favorite flavor. This year, Dunkin Donuts and Krispy Kreme are head to head in the social media and advertising race. Both donut giants have been tweeting and facebooking that they will be giving away free donuts all day today, so be sure to go and clean them out before someone else does! In keeping with the spirit of the holiday, we at ChefUniforms.com believe that sharing is caring. So, if you’ve got a great donut recipe (or one for any other type of delicious dessert pastry), share the wealth!